E-Book Distribution: What’s the Deal? The problem is that publishers and distributors are constrained from providing any hard information by the Non-Disclosure or Confidentiality agreements eBook retailers compel them to sign. Such agreements are required before negotiations begin and become an integral part of any agreements signed. The length of these eBook marketing agreements is about twelve to twenty pages; and their duration is for three to five years, an eternity in the fast-changing world of e-commerce. And many of them require that the publisher never can give any other reseller a better deal. ABA Book Buyer’s Handbook: Online, searchable, and continuously updated, the ABA Book Buyer’s Handbook is an invaluable resource for ordering and returns information, and it is available exclusively to ABA members. This electronic publication features publishers’ trade terms, including discount schedules, returns policies, imprint and ISBN prefix listings, co-op policies and more, as well as timely special offers. Since the ABA is hardly a secret society, every seller of print books knows exactly what every other bookseller is paying for stock. Everyone is treated the same so long as they operate more or less in the same category of the book business. (There are different terms for wholesalers, chain stores, gift stores, catalogs, and so on.) Publishers still cheerfully publish their detailed terms of trade for print books in the ABA Handbook. This sort of transparency has long been considered a simple question of fairness, an obvious way to keep the playing field level, and a painless way to prevent disputes. And until quite recently there just weren’t any unmentionable agreements between booksellers and publishers or their distributors. The idea was that long-term, trusted trading partners could be relied upon to keep the business humming along. Yes, there were some tough negotiations, but they were conducted in good faith, guided by the understanding that to keep the industry healthy all the players had to have a fair share of the profit. 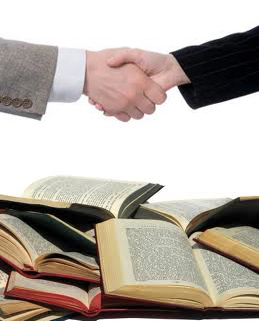 But now the agreements that certain eBook retailers insist on are draconian, multi-year, intricate; they have to be negotiated from scratch one by one; and all the parties to these agreements are rendered mute by non-disclosure or confidentiality provisions. There certainly is no “Handbook” to illuminate this murky business. Try this thought experiment. Your company has signed an agreement with an eBook reseller that specifies particular discounts and maybe also gives up some points for more discounts by another name, such as a co-op or an advertising allowance. You have committed to a non-disclosure or confidentially provision. You also have agreed to not give any competitor a better deal. Now you want to sign on with an additional reseller. This new customer wants to know the terms of your other deal, but you are contractually prevented from saying what these terms are. You are in a position where you have to say, “I can’t tell you the terms but trust me, they are just as good as the other guy is getting.” What a perfect recipe for misunderstanding, then mistrust, and finally litigation. Traditional participants in the book business, whatever their size, are in for a rough time. New players now marshal squads of lawyers and MBAs to strive for market dominance. They know nothing about the collegiality that used to be a defining characteristic of the publishing community; and they are unencumbered by any notion of cultural stewardship.